Ideas and explanations flow freely and clearly under an expansive curriculum of intellectual might at the Department of Philosophy. Pairing academic rigor with exemplary research, renowned scholars from around the world come here to live, work, and think in the heart of New York City. 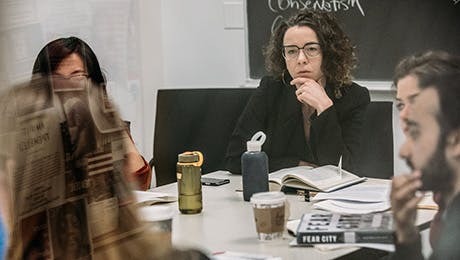 Our spirited community of faculty and students create an open atmosphere for the exploration and inquiry of the biggest ideas of historic and modern thought. The focus of study in the Department of Philosophy is the history of Western philosophical thought and the European philosophical tradition, particularly contemporary Continental philosophy. The graduate curriculum consists of two components. The first is the study of major figures such as Plato, Aristotle, Augustine, Spinoza, Descartes, Hume, Kant, Hegel, Marx, Nietzsche, Husserl, Heidegger, Freud, Gadamer, De Beauvoir, Adorno, Benjamin, Wittgenstein, Foucault, Derrida, Kristeva, and Irigaray. The second is the exploration of the movements, schools, branches, and ideas associated with those figures. Philosophy at The New School is thus the study of phenomenology, hermeneutics, and pragmatism; political and social thought; ethics, critical theory, and aesthetics; epistemology, metaphysics, and ontology; logic and language; rationality, methodology, and naturalism within the social sciences; nature, culture, beauty, and goodness; unconscious and conscious processes; and contingency, necessity, human freedom, tragedy, and truth. The department offers intellectually rigorous programs of study, each with its own requirements. The courses in Philosophy combine deep intellectual analyses of important philosophers with a robust and comprehensive survey of important ideas. Pairing an understanding of both thinker and thought creates a context in which to understand underlying concepts and examine bigger intellectual implications.